Traditionally Roulette is the most popular table game in live casinos often attracting many players around the table. This can be quite intimidating for a new or inexperienced player, but you shouldn’t worry. Roulette is a very straightforward game but there are a number of different types that are worth knowing about. The most complicated part of the game is knowing what type of bets you can make. 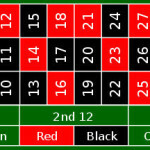 The basic aim of the game is for players to bet on a number or colour that they think a ball will land on when it is spun around the roulette wheel. The wheel contains 37 numbers (on a European wheel) or 38 numbers (on an American wheel). The numbers are coloured Red or Black. This is predetermined by their position in a number sequence that I’ll explain about shortly. After players have placed their bets the croupier spins the wheel and then spins the ball around the edge in the opposite direction. When the ball loses momentum it will drop into one of the coloured number wells on the wheel. The croupier then places a dolly on the winning number on the table and removes all the lost bets. This is normally done by sweeping them with their hand into a collection hole by the side of the table. Winning bets are then paid out. The European roulette wheel has 37 numbers, 1-36 with an additional 0. For numbers between 1-10 and 19-28 the even numbers are coloured Black and the odd numbers Red. For numbers between 11-18 and 29-36 the even numbers are Red and odd Black. The 0 (Zero) is normally Green. The American roulette wheel has an additional 0 called the 00 (double Zero) and this is also normally green. In online live roulette you’re likely to see 2 different table layouts depending on whether the game is being played with a European or American wheel. 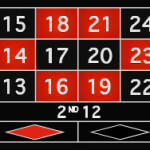 Bets are normally referred to as Inside Bets – bets on the numbers or combination of numbers within the central grid. Outside bets – bets placed on number combinations and patterns. Inside bets have higher odds than Outside bets. Then there is a range of special bet patterns often referred to “French Bet’s. I’ll explain those in more detail below. The wheel is divided into three sections Voisins du zéro, Le tiers du cylindre & Orphelins. A popular bet is to place a bet on all numbers on one of the section of the wheel. A “Racetrack” has been developed that allows you to place such bets, without having to remember the number sequences or locations of the sectors of the wheel. You just place your bets on the Racetrack and the dealer will do the rest. If you are playing online and using the Racetrack the software interface will place the bets exactly where you want. The most popular bet in the UK is the Tiers bet covering 12 numbers on the wheel. Neighbour bets are as they imply, you bet on a number and then the neighbour to either side of it. You can choose how many neighbours to include in the bets. There are lots of different combination to choose from. It’s a matter of your personal playing strategy as to what you like to do. Orphelins Covers 8 numbers 17-34-6 and 1-20-14-31-9. Roulette is a great live casino game. It is, however, a game of CHANCE, so no matter what you are told or read the House always has an edge and will over the long term win. The zero and double zero are the houses built in edge and I’ll demonstrate that simply. For single zero – There are 37 numbers you can bet on. So if you placed a bet on all 37, you would win. But the casino only pays out 35-1, so you get back 36 and the casino gets 1. You lose even though you’ve won. The house edge is therefore 2.70%. For double zero it’s even worse! – You bet on 38 numbers. You win, the casino pays you 35-1. You get 36 back, the casino gets 2. The house edge goes up to 5.26%. Look out for the La Partage rule, as this can reduce the house edge a fraction more. This is where half your stake is returned to you if you have made an even money bet and have lost to a Green Zero. Check out my Best Live Roulette Casinos page to see the best places to play, or if you want to know more the website Live European Roulette has a lot more detailed information about roulette.